X-steering is an fully homologated and patented active steering system for semi-trailers. Today it is used on more than 3000 trailers in the market. It not only give you increased maneuverability for your semi-trailer, so you can reach all your delivery locations easily. The system also reduces your fuel comsumption and tire wear dramatically. The x-steering system is available in many configurations, steering from 1 up to 4 axles, depending on the requirements. 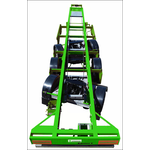 Products are supplied to the trailer builder as a modular package. This will guarantee short lead times. The X-steering system is the lightest and most compact active steering system in the market. For more info, please visit our website: www.x-steering.com. Or contact us at info@x-steering.com. 1. Any small or large trailer builder that want to innovate and improve its own product by implementing a proven active steering system. 2. Transport companies that are interested in saving substantial costs in their daily operation.